Been ages since I've just sat down and blogged. As I've said before, I've been working overtime on my Etsy shop. Ever since starting it back up, after the birth of my second son, I've been hard at work restocking it and getting involved with the Etsy community. Slowly my work seems to be paying off. I'm getting more views and a few sales. 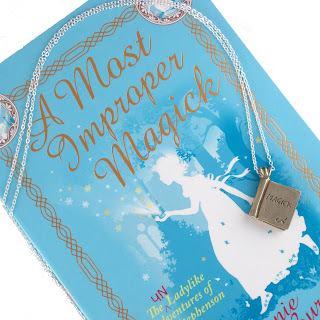 The Magick Book pendant from Stephanie Burgis's A Most Improper Magick/Kat, Incorrigible . You can buy the pendant on its own, or, if you act fast, with a signed copy of A Most Improper Magick. So, yes, that's what's been happening in jewelry world for me. As far as writing, goes, I'm working on a short story right now, an feeling like those ten years I've been trying and failing to write short stories are starting to pay off. I kinda sorta know what I'm doing and hope to produce another publishable piece. The novel project I had I've shelved for the moment to see if I can do some more, sellable, short stories. Ten years ago, I graduated from Clarion West and the plan was to start selling short stories to the major markets and thus get a little attention, maybe have an agent ask if I had a novel. Five years later, my writers group in New Mexico convinced me to turn back to novels, since my short stories were really awful. My novels weren't fantastic either, but they got me on a first name basis with some agents and editors. Then I sold a novel to a small press, and discovered it wasn't worth it to publish with a company I didn't trust or respect. And somewhere along the way, my subconscious figured out how to do short stories. Sort of. I hope. Now I find myself back where I was ten years ago, wondering if I can build up my reputation by selling short stories. We shall see. Good luck with your writing and building up your reputation! I wish my subconscious would figure out a way to do short stories. I've set myself a goal to write one of 5000 words that I can submit to Mindflights, but it keeps trying to swell up to novella size. If I thought I had enough material to make it a true novel, I might let it go, but as it is, it would probably get stuck at that awkward stage that nobody would want to publish. Indeed, and you should keep writing! My problem was ideas that were too big. Short stories have tiny ideas, but I couldn't every come up with little ones that weren't stupid. Which I may still have a problem with. We'll see. But as they say, novellas are harder to publish but a higher percentage of them win awards.